Great service with friendly staff. I really enjoyed our meal. Good prices and a great atmosphere. The squid was overcooked but the lamb was excellent! Would definitely recommend for anyone who loves a well-cooked meal! Visited this evening with family (3 children). From the first minute, the personnel were super-friendly and helpful. My wife and son wanted to try paella whilst the rest of us tried other dishes, and all the food was very tasty. The personnel made us very welcome, down to the detail of sparklers in the kids desserts. Deeply recommended. Staying at the ifa caterina this place is literally across the road. I had grilled chicken, my partner had steak. The steak was massive. 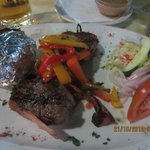 It all tasted fabulous and the service was amazing, nothing was too much trouble. Such a great place and very reasonably priced, loved it. Went here whilst staying at Riu Palace and the food was excellent and the sangria was very good too. Been to Restaurante Moreno II? Share your experiences!